Brian Horton has left his role as assistant manager at Doncaster Rovers. Horton was appointed two years ago – a month after Paul Dickov took charge of the club – and was brought in to add experience to the coaching staff. Candidates to replace him as Dickov’s assistant are likely to include Gerry Taggart and Rob Jones. Taggart was Dickov’s assistant at Oldham Athletic and joined Rovers in May as chief scout. 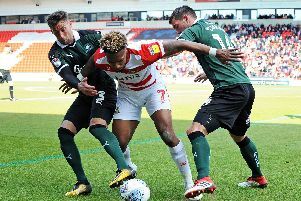 Player-coach Jones declared he would have a bigger role around the first team after signing a new one year deal last month.Horton meanwhile is confident Rovers are in a better place now than we he first arrived. The 66-year-old said: “It’s been a thoroughly enjoyable two years here and I leave knowing that the club and the team are in a better place. “Paul is working hard to attract more new players here and to build a team that can push for a play-off place and ultimately get out of this division. Paul Dickov added: “I would like to thank Brian for his time here, he has been a great guy to have around and to work with. “I have known Brian for years and over that time, including his two years here I have been able to lean on him for his experience and unbelievable knowledge of the game. Horton formerly managed Hull City, Manchester City and Huddersfield Town among others.